And here it is, the beginning of the summer movie season, kicking off with an entry from the franchise that effectively closed it off three years ago, with a surprising win. Welcome to your promotion, freaks. 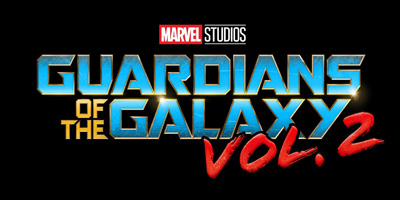 Guardians of the Galaxy took the world by surprise in late summer 2014, leveraging Marvel's hot hand to develop a movie based on one of the outfit's more... obscure properties, opening it to an astounding $94 million. This, when probably 98% of the public couldn't have named a single character in the cast up till then, and two of them were a talking raccoon and a monophrasic tree. A loose tone-remake of Star Wars, it also went for that Star Warsian 70s vibe, an element that it doubles down on for the sequel, subtitled Vol. 2, perhaps being the first film, at least the first in recent memory, to name itself after its soundtrack album. This film has a “all that, and more!” vibe to it, advancing the nostalgia a half-decade or so to Flash Gordon era film (a notion that's catching at Marvel, judging by that Thor trailer), and amping up the space battles, wacky sidekicks and space opera plotting (let's hope it advances past the “I hope that guy doesn't drop that rock” plot hole stage). Here, we grab on to the Continuing Adventures! of Peter Quill (Chris Pratt, the internet's boyfriend), Gamora (Zoe Saldana), Drax (Dave Bautista, the surprising best part of the whole thing), and the aforementioned raccoon and tree (Bradley Cooper and Vin Diesel, cashing their easiest paychecks ever). There's also some gold skinned aliens to serve as our antagonists, instead of the blue guys from last time, and a bee-alien thing, and Kurt Russell showing up as a hinted-at crucial character to Quill's backstory. However, what we're all here for is the space battles and wisecracks (space wisecracks?) in this, the pulpiest of Marvel's pulpy products. After the leggy(ish) performance of the last Guardians film, it's clear that we're in for a bigger opening – if not necessarily a bigger final total (at least not significantly so). It's clear that Marvel's gone drunk with power, launching movies like Ant-Man (an almost total remake of Iron Man) to $57 million, and Doctor Strange (admittedly one of their better untapped properties, if a tougher sell) to $85 million. It's Marvel's world now, with nary a flop in the post-Hulk era, and not even any real critical bombs to speak of, at least not on the level of some other comic-book film studios we could name. Enthusiasm seems a bit muted for this film though, accounting and adjusting for the overpowering success of the first one. I don't think it's really attracting new fans, even if some of the converts from last time will rush out a bit earlier to see this film and give it a warm May box office welcome. It's telling that it gets the leadoff spot, where the ultimate summer champ can come from, or at least get awfully close to that top placement. Reviews are... pretty good, but not amazing, the ads are... pretty good, not amazing – but it's putting out a fun, campy vibe, which is the important part of this. There's a new benchmark for Marvel now, and we'll have to see if the $146 million or so this opens to satisfies that new reality.